JackpotCoin (JPC) is a truly innovative coin with many new features. New hash algorithm called Jackpot Hashing Algorithm (JHA) uses variable hashing round with SHA3, Blake, Grøstl, JH, Skein – requiring a special miner to be mined. It is permanently ASIC-resist and with increased security and reduced loads. It saves power as compared to the conventional hash algorithms. It support both CPU mining and GPU mining. 2nd Generation of PoW/PoS coin. JackpotCoin PoW/PoS difficulty retargets are independent, with faster PoS block target to ensure faster transactions, yet different PoW block target does not generate too many coins to flood the market. Support true random superblocks. The true randomness eliminates the possibility that super-powerful mining pools (especially multipools) can profit from the pseudo-randomness based on the previous block hash. Multipools and cheaters cannot take any advantage of the true randomness of the superblock in JackpotCoin. JackpotCoin offers a Jackpot reward. The superblock reward depends on the distance from last superblock reward. The longer the distance, the bigger the reward will be. The Jackpot starts at 10x the normal payout, increases in a parabolic way (thus non-linear way) with the distance to last super block: at 3.5 days, it will be at 100x the normal payment, and if goes to 7 days without triggering the superblock, the jackpot will be increased to 1000x the normal payout. The superblock is triggered in true random fashion with average 3.5 days per superblock. 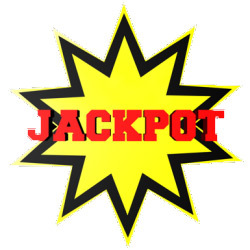 The JackpotCoin Client provides a special function to query the current jackpot size, and people can see it increases rapidly with time if not triggered. Total coins will be approximately 30 billions.